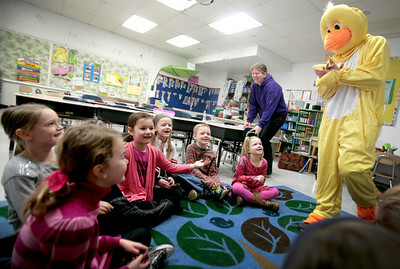 Michelle LaVigne/ For Shaw Media Robert Nye, Spring Grove Elementary School physical education instructor, explains to first graders (left to right,) Savannah Garcia, 7, Elissa Furlan, 7, Emma Minker, 7, and Kristina DeLeon, 6, that he has very poor vision while wearing the duck suit. Nye agreed to dress in a duck costume provided by the American Heart Association for the students on Friday, March 21st, 2014, after the students raised $10,000 during the Jump Rope for Heart Health event held at their school earlier in the year. Michelle LaVigne/ For Shaw Media "There is no goose here," Spring Grove Elementary School physical education instructor Robert Nye explains to Spring Grove students (closest left to center,) Emma Minker,7, Elissa Furlan,7, Savannah Garcia,7, Jamie Baldwin,7, Ryan Wisniewski,7, and Valerie Hinz,7, in Amy Bauman's first grade class (center,) when he fails to shout "Goose!" after playing "Duck, Duck, Goose" with them. Nye agreed to dress in a duck costume provided by the American Heart Association for the students on Friday, March 21st, 2014 after the students raised $10,000 during the Jump Rope for Heart Health event held at their school. 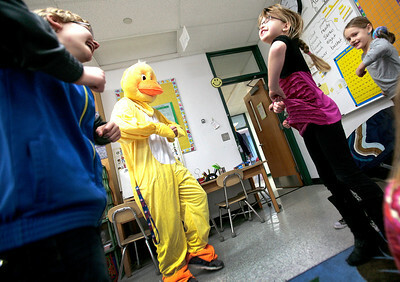 Michelle LaVigne/ For Shaw Media Robert Nye, Spring Grove Elementary School physical education instructor, leads Spring Grove first graders (left to right,) Hayden Freund,10, Cayla Langford, 6, and Elissa Furlan,7, in a duck-themed "Chicken Dance." Nye agreed to dress in a duck costume provided by the American Heart Association for the students on Friday, March 21st, 2014, after the students raised $10,000 during the Jump Rope for Heart Health event held at their school. Michelle LaVigne/ For Shaw Media After visiting a classroom of first graders on Friday, March 21st, 2014, Robert Nye, Spring Grove Elementary School physical education instructor, cools off by removing the head portion of the duck costume provided by the American Heart Association. 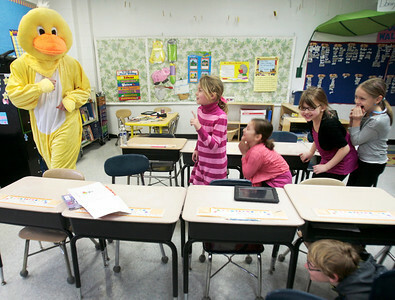 Nye agreed to dress in a duck costume for the students at the school after the students raised $10,000 during the Jump Rope for Heart Health event held at their school earlier in the year. 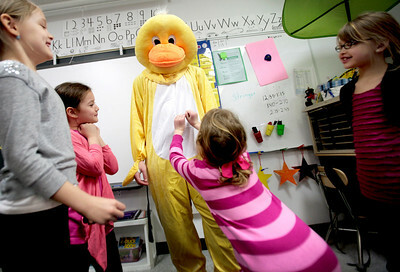 Michelle LaVigne/ For Shaw Media Spring Grove Elementary School first graders (left to right,) Emma Minker, 7, Savannah Garcia, 7, Cayla Langford,6, Elissa Furlan,7, and Hayden Freund,10, (lower right,) attempt to sneak up behind Robert Nye, physical education instructor, dressed in a duck costume for the students on Friday, March 21st, 2014. The duck suit was provided by the American Heart Association after the students raised $10,000 during the Jump Rope for Heart Health event held at their school. After visiting a classroom of first graders on Friday, March 21st, 2014, Robert Nye, Spring Grove Elementary School physical education instructor, cools off by removing the head portion of the duck costume provided by the American Heart Association. 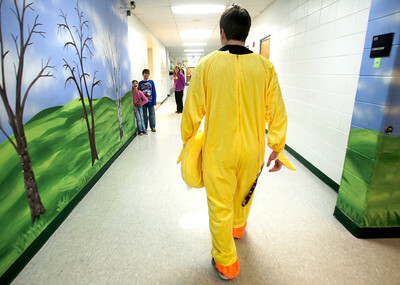 Nye agreed to dress in a duck costume for the students at the school after the students raised $10,000 during the Jump Rope for Heart Health event held at their school earlier in the year.